The Dominican Republic's Licey Tigres won the Caribbean Series championship in 2008. Helping them get there was their manager, Hector De La Cruz. "We played good baseball and this is what happens when you do that," De La Cruz told MLB.com after his team beat foe the Aguilas Cibaenas. "The Aguilas are a good team but this is baseball. You play hard every night and do things right you can win." 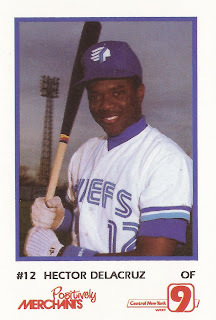 De La Cruz was managing in his native country, part of a managing and coaching career that he began after his days playing in the minor leagues and overseas ended. Stateside, De La Cruz has managed and coached in the Diamondbacks system for a decade, returning to helm the Missoula Osprey for 2011. De La Cruz' baseball career began in 1984, signed by the Blue Jays. He played that year and part of the next in the rookie Gulf Coast League. He played the other part of 1985 and 1986 at single-A Florence. In July 1986, De La Cruz amounted for most of Florence's scoring in a 4-3 win. He snuck a single through to score two in the sixth, then stole second and scored the tying run in the ninth, The Charleston News and Courier wrote. De La Cruz first made AA in 1988 at Knoxville, then hit AAA Syracuse that same year. Between the two stops, he hit only .195. He returned to Syracuse in 1989 and then in 1990, hitting .179 the first year, then improving that to .234 in 1990. De La Cruz never made the major leagues, but in 1991, he signed on with the Yomiuri Giants, playing in Japan. He later went on to play in Taiwan and in Korea before his playing days were done. De La Cruz has coached with the Diamondbacks system for the last decade, serving as hitting coach at Missoula in 2001, moving to the same post in 2002 at South Bend. De La Cruz returned to Missoula in 2005 as manager. After going through managing jobs in Visalia and Mobile, it was back to Missoula in 2010. He is to remain in Missoula for 2011. In announcing the Missoula 2011 staff, Osprey Executive VP Matt Ellis called De La Cruz "a top level manager." "He is one of the most popular managers in team history," Ellis said in the announcement. "His positive attitude and extensive baseball experience are a huge asset to our organization. We couldn't be happier to welcome Hector back to Missoula."